Are you feeling bored with the routine selfies taken with the selfie stick? What if you can take the flying selfie? Then you must have to see the “Roam-e” the 360-degree drone which helps in capturing the photos in a distinctive way. This is the product developed by the IoT group which is committed to creating the new technologies to change the world. 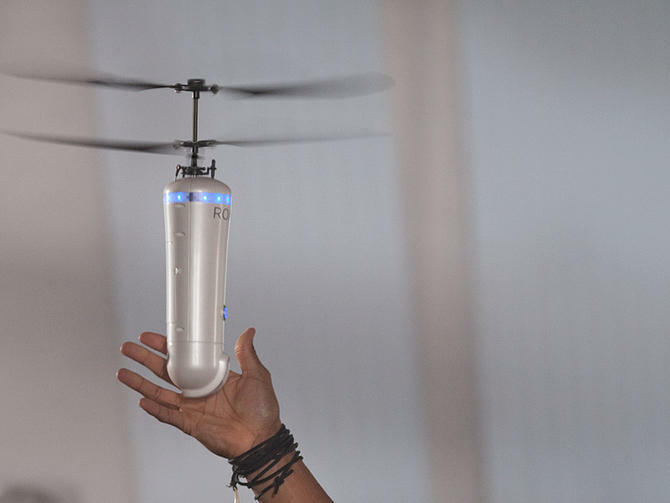 Introducing the Roam-e, the Flying selfie drone designed in Australia. The hand free selfie has arrived, and the best thing about Roam-e also uses the smart facial recognition technology. When the Roam-e is placed in the selfie mode, then it keeps the sight of your face, not the device. The way of taking the selfies you know is completely changed with the Roam-e.
Roam-e is designed with the frameless body, and the resolution of this camera is 5 Megapixel CMOS Sensor. Roam-e comes with the ARM Cortex M4 dedicated flight controller. It can be folded up to 85mm at its widest point. Roam-e comes with the world’s first dual axis collapsible blades. The flight time for this device is up to 20 minutes, and it supports the fast charging. To complete the full charge it takes just two hours time. The flight range contains four flight modes which include navigation, scout and pilot which can have the range of 25m and in the selfie mode the flight range is 3m. The built-in smart facing recognition technology recognizes your face and captures the perfect selfie. With the help of Roam-e, you can capture the uninterrupted panorama photos and the perfect and stunning 360-degree photos. You can stream the action in the live with the aid of the application. Live streaming can be done anytime from anywhere. Roam-e is comfortable to handy and light, and this is easy to carry. It can be taken to any occasion anytime, and this is very portable. Pre-order the Roam-e now at the official website. The price of the Roam-e is $399.00 USD.